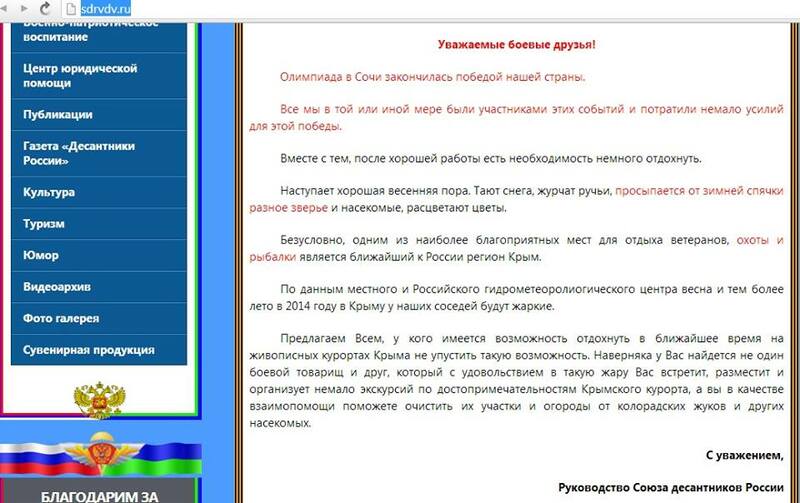 Russian social networks are summoning “tourist” units to go to Ukraine, inviting men aged 18 to 45 with army experience. Numerous groups in the social network VKontakte share such invitations. A) Go there as a volunteer. We are sending people to Donetsk and Kharkiv as the most important resistance centres. It is also possible to go to Odesa. If you have decided to go to Donetsk, please contact Vladimir http://vk/com/***** E-mail: prokop************* Tel.:+7-950-***-**-**. https://docs/google/com/forms/d/1CV70G*************… Thereafter send me a private message – I will let you know where, when and at what time we are going to mobilize into one array and be transported to Crimea (we are already awaited for in Crimea and escorted to our locations). Additional organizational information can be found here: http://vk.com/oborona.ua. You’ve got 15 to 18 hours to think it over. We depart tomorrow night from Rostov-na-Donu. I am also coming along. P.S. carry around your Russian Federation passport, Russian money for pocket expenses, warm clothing, cold weather footwear, packed meal for 24 hours, means of personal hygiene, personal dishes, water and medicines. Bladed, stabbing and fire weapons must be left out (the customs office would not let those in). While the aim of the tourists’ ventures is stated explicitly, the union of paratroopers is more discreet in its intentions. The Sochi Olympics have concluded with the victory of our country. All of us, in one way or another, have partaken in those events and made quite an effort to achieve this victory. At the same time, having done some good, hard work, it is necessary to take a little break. The springtime is upon us. The snow is melting, the streams are warbling, all species of animals and bugs are coming out of hibernation, and the flowers are starting to bloom. It is beyond doubt that one of the best places for the veterans to rest, hunt, and fish is the region of Crimea, located in immediate proximity to Russia. Both the local and the Russian Weather Service Center report that our neighbors in Crimea will be experiencing a very hot upcoming spring and, even more so, summer of 2014. We suggest that all of you who have the chance in the nearest future to take a break at the picturesque resorts of Crimea: please do not let this opportunity pass. It is quite likely that you have more than one comrade in arms or friend, who would be happy to meet you during these hot times, host you, and organize countless tours of the sights of Crimean resort for you. And you, in turn, could offer them mutual assistance in clearing their landplots and gardens from potato bugs and other insects.